Congkak is played for centuries and if is my favourite game when I was just a little girl. The rules were simple that allow the boards to have different numbers of holes. Congkak boards are often made of teak or mahogany wood but for modern congkak, it is made from plastic. Lighter and easier to carry everywhere that we want. The word congkak is believed to originate from old Malay "congak" meaning "mental calculation which is mainly practiced in this game. It is regarded that an efficient player who mentally calculates a few steps in advance will have an advantage in collecting points to win the game. 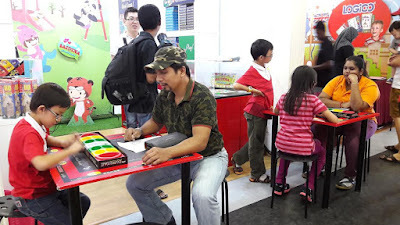 To encourage my Little Angels to learn on mental calculation, Mommy Jane had bought a high quality SPM Congkak which is light-weight, colourful and even foldable for them to play. It is also washable as it is made of durable plastic material. 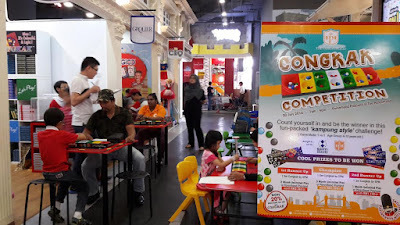 Since my Little Angels were quite expert playing congkak now and it is our favourite past times games that bond us together, Mommy Jane had brought Little Angels to join the Congkak Competition that was held at the Parenthood Playland, Sunway Putra Mall recently. With the theme "Count yourself in and be the winner in this fun-packed kampung style challenge", me and my Little Angels had accepted the challenge to enjoy ourselves there. The board has fourteen holes in two sets of seven plus an additional bigger hole for each player. Each player controls the seven hole on their side of the board and their score is the number of seeds in their right-hand big hole called storehouse. Instead of 2 players play simultaneously, SPM games had set out the number of seeds at each hole so that 1 player can play instead and the participants with the most number of seeds at their hole will become the winners. Every participants scores were recorded. At the end of the contest, since there are 3 participants with the same scores i.e. at 34 points, the Parenthood Playland and SPM games organisers had organised a contest where 2 players were to play together to decide for the 2nd, 3rd and 4th prize winner. Since my Little Angel, WH had the highest score of 40 points, he had won the 1st prize for the contest. 1st prize winner brought home a 3 months unlimited play at the playland, 2nd prize winner received 2 months, 3rd prize winner received 1 month and 4th prize winner received goodie bag from the Parenthood. All the winners had also brought home a SPM Games Congkak board each. Congrats to my Little Angel, WH and all other winners for winning such an attractive prizes home. To encourage children to play those educational games while parents can go for shopping around the area, the Parenthood had few free games for children or adults to play with. There are caroms, stacking game, lego, colouring and even some rides for the scooter or battery bikes around the Parenthood area. For parents who are looking for educational games for their children, they could get it now at the Parenthood. For more information and details, do visit the Parenthood website at http://theparenthood.com.my/ or you can just like them at their facebook for more activities and contest in future at https://www.facebook.com/The-Parenthood-983915141672761/home. You can visit SPM games at their website for more educational games too at http://spmgames.com.my/. It was indeed a fun day for all of us. Even a simple game can bring joys and bonding session with our loved ones. Congkak indeed was a great game for our little ones to unconsciously learn counting and quantity estimation. It helps to train and refine our children's motor skills while spending quality times together. Although I do know how to play it, I don't really know the strategy. I'd like to learn it and play better. This was a good event to get kids started on the traditional game. Emily, you can learn the strategy too once you play more often. I'm sure you could master it too. congkak is one of favourite games that i play with my siblings.. Damn fun if you know the trick..
May, agreed with you. I played with my siblings too when I was small. It was indeed fun. Pui San, nowadays kids more to tablets. We should encourage them to play traditional game while learning some calculations. Actually I don't know how to play congkak!! !This is meaningful event!! Bearhy, you should learn it instead and it is a fun game. I'm sure you will love it too. Amelie, indeed it is. You should start playing it and I'm sure you will fall in love with it again. I even forgot how to play with congkak now! Should find a time to learn how to play again. Shini, it is very easy to learn. Once you're on it, I think your memory will be back. Hanniz, traditional version too heavy. Modern type lighter and easier to carry for travel.